With fresh veggies in the garden and a fantastic crust recipe in hand, I’ve been going galette mad all summer! 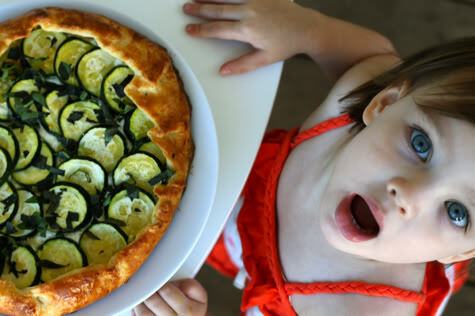 Call it pizza (even though it’s SO NOT pizza) and your kid will eat it, vegetables and all. You can make a Tomato & Goat Cheese Galette like mine, or the zucchini one pictured above, or use pretty much anything you have laying around. It’s a simple way to seem like a very fancy cook. The galette obsession started with this Zucchini and Ricotta Galette recipe from Smitten Kitchen. It’s TOTALLY AMAZING. Her crust is wonderful (and simple) and I’ve been using it non stop to toss fresh veggies on and throw in the oven. This tomato galette is one of the versions my family enjoyed. Whisk together the flour and salt in a large bowl. Sprinkle bits of butter over dough and using a pastry blender, cut it in until the mixture resembles coarse meal, with the biggest pieces of butter the size of tiny peas. In a small bowl, whisk together the sour cream, lemon juice and water and add this to the butter-flour mixture. With your fingertips or a wooden spoon, mix in the liquid until large lumps form. Pat the lumps into a ball; do not overwork the dough. Cover with plastic wrap and refrigerate for 1 hour. Now while that is chilling, let’s make the filling. Spread the tomatoes on paper towels. Sprinkle salt (about 1/2 teaspoon will do) over the tomatoes and let sit while you make the rest of the filling. Push a clove of garlic through a garlic press into the 1.5 tablespoons of olive oil in a bowl. In another bowl mix together all the cheese and 1/2 tablespoon of the garlic olive oil you just made. Preheat oven to 400. Roll the dough out on a floured surface to 12″ wide. Slide it onto a baking sheet covered in parchment paper. Push the cheese mixture onto the dough spreading it to about 2″ from the sides of the dough. Blot the tops of the tomatoes and lay them on the dough in concentric circles. Sprinkle with the remaining garlic olive oil. Bake the Galette for 30-40 minutes until it is golden brown. Remove from the oven and sprinkle with the basil and optional olives and/or pine nuts. Serve it in slices any temperature but cold. You won’t have any leftovers so that will surely not be an issue. Watch in disbelief as your kid devours it all. So, do you think you might try one? Or do you already love to make galettes, in which case can you send me some new fillings to try? This is summer recipe perfection! And that first picture of Scarlet is sooo cute!!! That looks amazing!! I also have a plethora of zucchini. I think I know what's for dinner tonight 🙂 thanks!! sounds great! i'm going to make tonight. I've never heard of Gallettes before. (See? Don't even know how to spell it!) But, those look absolutely delish! Thanks for the great recipe to try! I've been following you since I was five months pregnant (my little girl is now 2 months old), making lots of Prudent goodies for us, but somehow never got round to commenting on how much I love you and your blog! You've inspired me to do a self-righteous wholemeal galette later on (it's winter down here in Argentina so there'll probably be some pumpkin in there). Have you tried doing a sweet one? They're amazing… Add only a touch of sugar (or even none at all) to the dough, and top it with peaches or strawberries, pour an egg and thick cream mix over it, sprinkle some sugar on the top and mmmmm. Another killer combination is to put chopped dark chocolate on the bottom, top with fanned sliced pears, and then the egg and cream mix and sugar: when it cooks the pear juice and custardy stuff does something funky to the melting chocolate and it seems like you've made a chocolate cream on the bottom when all you've done is blitzed a bar in the processor. Sophisticated and very moreish. Besos! i have loads of zuccs and tomatoes from the garden thanks for this idea! yum! she looks like she's shocked by a bad word that was said in the first picture! I have NEVER heard of Galettes before today – but you can bet your bippy I'm trying them for dinner tomorrow! Anything that vaguely resembles pizza is a hit with my kids. And, cute picture of Scarlet at the beginning of the post! Great idea to stand above her – did you have to stand tippy toe on a chair to get that shot??!! I love this! I have half a dozen eggplants staring at me everytime I open the frige and tommarow they will finally be cooked! Thanks for sharing. but never savory ones. looks delicious! Yummy…we had made Kinishes with garden veggies but this looks so good too! Our farmer's market is coming up on Saturday. I can't wait to get the goodies to try this (and also hoping they still have the 8 ball zuchinis for Tartlette's stuffed veggies.) Never understand why people complain about too much zuchs in the summer when you can turn them into beauties like that galette! cannot wait to cook this with my kid. looks incredible. I made the zucchini galette recipe exactly as written, except I topped it off with a few tomato slices. It was fantastic! I fed it to three children (ages 2 – 11) who had previously rejected zucchini and they all asked for seconds. And it was real, real pretty to boot. I have suddenly come across galettes everywhere it seems! So after your post, I simply HAD to make one. And make one I did- with a cilantro/jalapeno pesto, fresh tomatoes and feta. But I'll say this: I'm a working mom, and when I read the recipe for the crust… well, I balked at putting the flour in the freezer for a half hour. SERIOUSLY!?!? Who has time for that?? But I followed the crust recipe faithfully. And we ate dinner at 8:30 after my little man was in bed already (he ate something different that night). But it was delicious. Perhaps a weekend recipe for this working mom. Nonetheless- thank you for inspiring me to try something new!! i make tartas of pumpkin and carrot (i add some eggs and some cheese, this is the only one he eats because i use the minipimer to make it "pure"), zuchini, eggplant… i love that one!!! by the way i did weeks ago the art smock, not from here, i saw it somewhere else and i love it, later i show you!